Mumbai: Sales of cars and two-wheelers increased sharply in August as consumers timed their purchases to coincide with three Hindu festivals—Janmashtami, Raksha Bandhan and Ganesh Chaturthi—that fell in the month, according to individual figures released by manufacturers on Tuesday. Market leaders Maruti Suzuki India Ltd, the country’s largest car maker, and Hero Honda Motors Ltd, the biggest maker of motorcycles, led the growth. A 39.3% rise in sales of its compact cars and a 41% increase in sales of the SX4 and Dzire sedans boosted Maruti’s sales to 84,808 units in the month. The company’s shares on Tuesday rose to a record Rs1,520.80 on BSE, up 5% from its previous close. The Indian subsidiary of South Korean car maker Hyundai Motor Co. reported 12.9% growth in domestic sales. Helped by demand for its Jazz and City models, Honda Siel Cars India Pvt. Ltd’s sales rose 4% to 4,102 units. Sales at Skoda Auto India Pvt. Ltd, albeit from a low base, also rose 33% to 1,463 units. Auto makers in India, who only report sales to dealers, typically push out inventory to showrooms ahead of the festive season, leading to a spike in wholesale numbers, analysts said. “This year (as) we have an early festive season, manufacturers have started filling up the dealer pipeline by dispatching (a) higher number of vehicles," said Joseph George, an analyst at BNP Paribas Securities Ltd.
August sales at Hero Honda, which sells every other two-wheeler in the country, reached a record for a single month, the company said in a statement. It sold 415,137 two-wheelers in the month, a 36% increase over the same period last year. 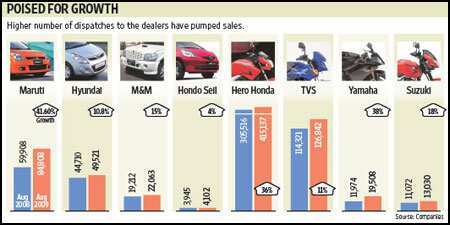 Other two-wheeler firms reported strong sales. TVS Motor Co. sold 126,842 units, an increase of 11%, while Honda Motorcycle and Scooter India Pvt. Ltd, Suzuki Motorcycles India Pvt. Ltd and India Yamaha Motor Pvt. Ltd reported increased sales of 13.8%, 18% and 38%, respectively. Analysts are wary if such strong growth can be sustained. “The growth seen in the two-wheeler segment has been pumped by a significantly higher number of dispatches to the dealers, and it’s not for real, " cautioned Mahantesh Sabarad, an analyst at Centrum Broking Ltd. “What we are seeing now is largely a function of an event called festivals." Tata Motors Ltd, the country’s largest auto maker, also posted a cumulative increase of 14% in its truck, bus and car sales to 49,810 units. Its medium and heavy-duty truck sales increased 10% to 11,118 units in August. Sales of Mahindra and Mahindra Ltd, the country’s largest utility vehicle maker, increased 17% to 21,410 units.